The Slope-slidin' Sewer Star! 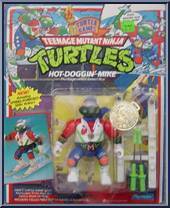 VITAL SKITISTICS: Accessories: Removable Turtle Shell Skis, Katana Blade Ski Poles & Turtle Games Gold Medal! Favorite Course: Sewer Slush Mountain Longest Ski J. . . 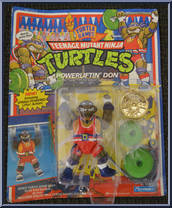 The Super Strong Sewer Sportsman VITAL LIFTISTICS: Accessories: Turtle Shell Barbells, Bo Pole & Turtle Games Gold Medal! Record Lift: 2000 Turtle Tons Recommended Food: Anti-Foot Fiber Best. . . The Paddlin' Party Player! 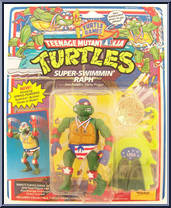 VITAL FLOATISTICS: Accessories: Anti-Foot Flipper Fins, Kowabunga Kickboard, Sewer Snorkel & Turtle Games Gold Medal! Total Career Laps: 30 Turtle Trillion Dive: Th. . . The Hammer Throwin' Hero! 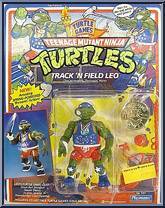 VITAL TOSSTISTICS: Accessories: Ooze Ball Shot put, Sewer Discus, Ju-jitsu Javelin, Kowabunga Claw Hammer & Turtle Games Gold Medal! Proudest Moment: Being able to throw. . .